RE: Show us your Beaver! Hey there War Birdman... Paul from New Zealand here. Got myself the yellow, white and blue KMP Beaver. Just been checking through some of the threads and thought I'd ask you about some of the mods you may have done to yours. 1, Not a real biggie, but can I paint over the covering? Thinking of making mine a Warbird as the Australian Airforce had one with floats. So I'd like to paint it all green or silver. 2, Don't like the wire land based u/c, do you know of any good scale type remidies here? 3, Did you use the factory fuse servo mounts and control rods? Thinking of running SIG type golden rod down the bottom of the fuse and getting the control surface attachments to the inside ( not showing ). 4, Have you beefed up the fuslage from the tail forward to the former at the rear of the main wing ( just asking as this is my first glass one ), extra expoxy around anything? Oh my elevators have a 1/2 inch gap between them and the fuse, and like wise with the Flaps... did yours too? and have you fixed that? As far as the landing gear, I think one can use the wire gear and make up some more scale looking fairings over them. I'm only using mine for a few test flights until I get it all dialed in and then permanently installing the floats on it. I plan on using the servo mounts depending on how it balances out and making up my own push rods. I would beef up the tail area where the stabilizer mounts to the fuse and the fuselage to the firewall. (You can twist the firewall the way it comes out of the box.) As far as beefing up the fuse between the tail and wing, I don't think is necessary. It's not meant to be an aerobatic airplane. Check to make sure the formers or secure. On mine they were hot glued in and some were loose right out of the box. 1/2" gap? Mine is about 3/16"on the elevators to fuse and I did add an 1/8" to the flap ends to close up the gap to the fuse. Overall I think it's a nice plane. It's just that some of the hardware and mounting methods need to be improved and or modified along with the instructions. For all you Beaver fans, Check out this web site. Tons of full scale pics and info. G-26 onboard start, lots of goodies.. 22# flys great. short curcuit in the controller... Would you have thought, that fire would be the element that ends the "life" of a float plane? By the time I had rowed out to the bird in a littly dinghy, it was far gone. Engine and floats were saved (see next post). So here is the new and improved beaver (HVP modell of Czech Republic)... complete with flaps, position-, anti collision- and landing lights.. [link=http://www.ramoser.de/home_e/varioprop_e/varioprop_e.html]Vario Prop[/link]. Brushless motor (no combustion engine allowed on lakes here in Germany), 5S2P Lipos. Radial engine done with Williams Bros. cylinders that I found somewhere in the farthest corner of a Sydney hobby shop while being on vacation down under. landing gear mounted for test flights. Now she's on floats and flies beautifully. Quick question for all you beaver fans. Especially those that have dealt with Unionville. Have you found it fairly easy to put that kit together? I was thinking of getting the 8 footer as my third aircraft but it would be my first real build although I've had to repair mine a little and I have a 4 star that was given to me that I have to repair as well. My dream is to have a Beaver on floats and that's what I really want but I'm concerned I just don't have the knowledge to put it together myself as a first kit attempt. Any other suggestions are welcome. KMP is really neat but the price of it really puts it out of my league. I think you have to take a look to my Beaver kit. They are VERY scale and fly great. You can download the building manual on my website to see the knowledge required to build it ! My float kit will be ready in a couple of week. My first Beaver was a V-Mar 60-90 sized one.. I found it pretty good looking ( scale like ) and easy to put together. Though they are quite the same as the one KMP or the closterman Beavers, I thought it represent good value. Once I had built it ( powered really nicely with a Thunder Tiger 91 Four Stroke ) I flew it heaps, actually flew nicer that a trainer, just bigger! I bought a set of great planes 60 sized sport floats later for it. I decided after a few months of flying it that the nose "looked" too long and I shortened it ( quite easy to do ) by nearly 3 inches. To get the CofG correct all I did was to mount the flight batteries against the engine bulk head and also put in onboard glow system and it's battery well forward too. It does look nice. I'll have to keep that in mind. 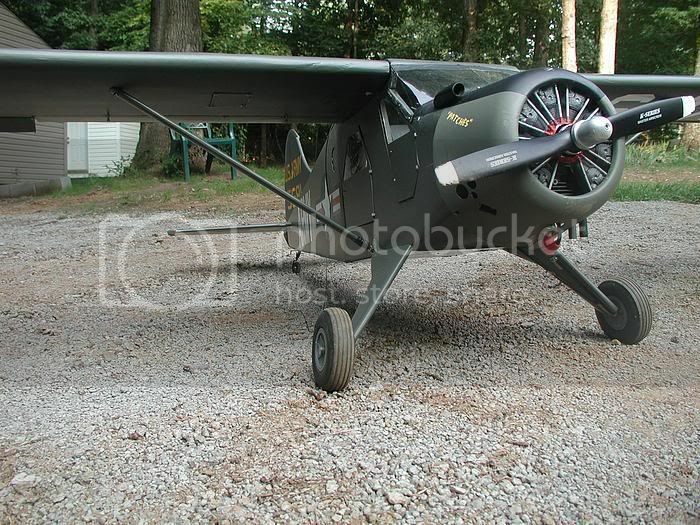 Racer-RCU nice military Beaver.. A ? what dummy engine did you use? 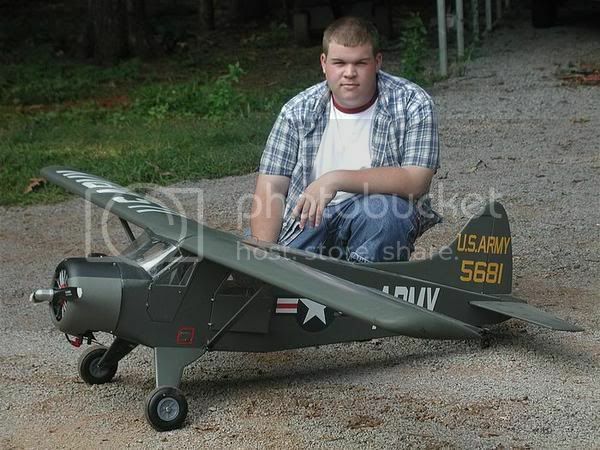 This is my beaver from a few years ago,ikon n/west 1/4 scale. powered by a US 41 flew great till i dumb thumbed it. this pix was taken at Kenora Ontario float fly. Hope some day to get another one. Just had our first FLoat Fly of 2007 this past weekend... frustrated by a hard starting ZDZ40, I only managed 2 flights on my KMP Beaver. Lots of fun, though! Thanks to Arobatx for the pics! great to see you flying the Beaver. Hope you get the zdz bug worked out, it seems when they sit up for awhile the get tempormental. Im still working on mine , still got a long way to go. Looks like you've made some progress, Wade. Keep chipping away. You won't be dissapointed. This plane has serious "presence" in the water. Every time I think I get the ZDZ dialed in, something changes. I just can't believe that a gas motor would be so susceptible to humidity or weather changes (or whatever it is that's causing me grief). I have been hand starting it. Sometimes it pops right off, while othertimes, like this past weekend, it makes me seriously consider buying a Zenoah. I finally have a spinner for it (as of yesterday), so I think I'll have more success get it started and tuned properly when I can crank it with a starter (can't keep a starter centered on the hub without a spinner... near shakes the nose right off the plane). Now get off line and get back to work on that plane, Wade! You guys using gasser? What size props have you got on them? I have a Saito 180 FS mounted into mine and was going to run an 18x6... yours looks 20's at least. I'll post some pix of my progress soon. mine now has a removable tail for transporting. I am useing 20x8 for break-in, than I will switch to 3-blade 19x10. Removable tail, thats sounds like some serious modifacation. Paul, I am using the same motor and prop as Wade (2-blade). Another member in my club flew a 20 lb Decathalon on floats with a Saito 1.80, and it flew pretty well. So, I would guess that it will fly the Beaver, too. I keep promising to weigh mine, but I never seem to remember... and I rarely see the guy in our club that carries around a hanging fish scale in his tool box. Next time I see him (and I have the Beaver) I'll be sure to get that info. I am intersted in seeing your removable tail modification, too. Post some pictures! Will the G62 be enough power? I have talked with another guy flying giant scale on floats and he says APC's are the only prop that stands up to the water spray. Said he ruined a Mejlik in one flight? If I wan to go with a larger engine, APC will not likely have a prop to suit. What are you guys using to stand up to the abuse?